I heard the term “Rainbow Baby” during a conversation and wondered what it was about. Having worked with child loss in a few areas such as educational courses, extra training with the “Pregnancy and Infant Loss” network (PAIL), Project Rachel for post abortion counselling and one on one counselling with clients; I have never heard this term before. Keeping true to form, I wanted to share my new found knowledge with you. “Rainbow Baby” does not appear to be an official term used in the media or in educational publications. 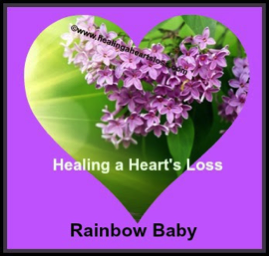 Rainbow Baby refers to a pregnancy after the death of a baby; or a pregnancy loss. The idea is that a rainbow comes after a storm, which is synonymous with the loss and grief being a storm and a new pregnancy being a rainbow. The new baby is seen as something beautiful after the storm surrounding the prior loss. The term Rainbow Baby also, acknowledges the loss occurred and is symbolic of the storm the parent(s) went through. What are your thoughts on this, “Rainbow Baby”? As I pause and contemplate the question I wonder how a mom or dad really feels about this term. How would I feel about this term when looking at a new baby and remembering the pregnancy that ended in a different manner? Well, what comes to mind is loss, hurt, sadness, despair and so much more that has the potential to last in some cases for decades. Being pregnant again and delivering a baby does not necessarily diminish the prior loss. Is this a case of happy and sad at the same time? Perhaps! The term “Angel Baby” is another term I came across that is given to a child that died due to a miscarriage, still birth or neonatal death. I do not know who designates the name for babies in any given situation. Knowing what I know about child loss and pregnancy there may be fear, fear that another child will die or another pregnancy may not make it full term. Even after a subsequent child is born there is still a stirring in the back of a parent’s mind that worries about how to keep this new child safe and alive. Many do not realise a new mom or dad will be thinking this way and most often “others” are not receptive to hearing a parent’s comments surrounding this concern or more. Is “Rainbow Baby” used as a term by outsiders who want everything to be okay? Lastly a note about the “Angel Babies”; someplace, someone is saying or hearing the words “Angel Baby” and softly thinking I will always remember you.